From the artisan studio of potter Colm de Ris comes this extraordinary hand-thrown and hand-built tableware. Luminous glaze in the deep blues, purples, and umbers of twilight melds with delightfully unexpected shapes, finely crafted, to transform your table into a work of art. The unique shape of the Viking bowl will delight your guests and inspire you to culinary heights. Viking bowl measures 6" high, 12" long. 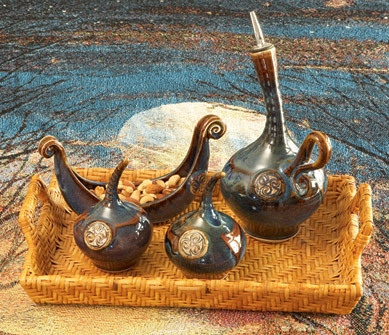 The gourd-like shape of the salt and pepper shakers is also reminiscent of a curious bird. Sorry, oil & vinegar decanter shown no longer available. Each piece is individually thrown and glazed; expect noticeable variation. Oven and microwave safe. Handwashing is recommended. Handmade in Dublin, Ireland. Gift wrap and rush delivery are not available. Discontinued; limited styles and quantities available. For more Colm de Ris items, please click here. Beautiful! Love it!!! Service all the way around was wonderful! I gave the mug to my husband for Father's Day. He just loved it. The colors of the glaze are just beautiful and rich. The design of it is so nice and holds quite a bit of coffee. The only thing that may be improved is the handle hole needs to be bigger for men's larger fingers. The piece is a work of art and really a lovely piece of pottery for my collection. The whole set is on my wish list!! The plates were much prettier than I expected. They are also a lot heavier than I had anticipated. I was surprised and pleased on both accounts. This beautiful pottery comes from Dublin, Ireland. It is just beautiful. I could hardly wait for it to arrive. Everyone was so nice at Gaelsong. The tea pot is beautiful and the viking dish. Color is out standing. You won't be sorry if you order it. The Viking boat dish I ordered arrived today, and I am delighted with it! Beautiful and graceful, it is the perfect gift for my Irish brother and his Danish wife. I bought this set and I am so pleased!!!!! The pictures do not entirely do the product justice. The items are larger than they seem in the picture and extremely well made. They are heavier than standard plates, and they vary slightly in size and shape - which is a feature that I love. The colors are beautiful. The bowls have a terrific shape that makes them very easy to hold. Excellent if you enjoy large bowls of cereal. You truly feel like you have a special set with these dishes.